The IF function is one of the most popular and useful functions in Excel. 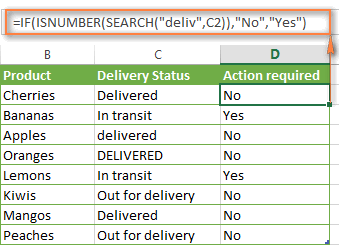 You use an IF statement to ask Excel to test a condition and to return one value if the condition is met, and another value if the condition is not met. In this tutorial, we are going to learn the syntax and common usages of Excel IF function, and then will have a closer look at formula examples that will hopefully prove helpful both to beginners and experienced Excel users. 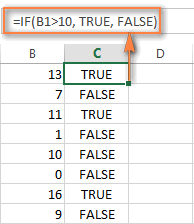 The IF function is one of Excel's logical functions that evaluates a certain condition and returns the value you specify if the condition is TRUE, and another value if the condition is FALSE. As you see, the IF function has 3 arguments, but only the first one is obligatory, the other two are optional. logical_test - a value or logical expression that can be either TRUE or FALSE. Required.In this argument, you can specify a text value, date, number, or any comparison operator. For example, your logical test can be expressed as or B1="sold", B1<12/1/2014, B1=10 or B1>10. value_if_true - the value to return when the logical test evaluates to TRUE, i.e. if the condition is met. Optional. value_if_false - the value to be returned if the logical test evaluates to FALSE, i.e. if the condition is not met. Optional. Excel IF function - things to remember! Though the last two parameters of the IF function are optional, your formula may produce unexpected results if you don't know the underlying logic beneath the hood. 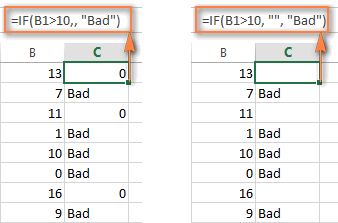 In case you don't want your Excel IF statement to display any value when the condition is met, enter double quotes ("") in the second parameter, like this: =IF(B1>10, "", "Bad"). Technically, in this case the formula returns an empty string, which is invisible to the user but perceivable to other Excel functions. If you don't care what happens when the specified condition is not met, you can omit the 3rd parameter in your Excel IF formulas, which will result in the following. Note. For your Excel IF statement to return TRUE and FALSE as the logical values (Boolean values) that other Excel formulas can recognize, make sure you don't enclose them in double quotes. A visual indication of a Boolean is middle align in a cell, as you see in the screenshot above. If you want "TRUE" and "FALSE" to be usual text values, enclose them in "double quotes". In this case, the returned values will be aligned left and formatted as General. No Excel formula will recognize such "TRUE" and "FALSE" text as logical values. The formula compares the values in cells A1 and B1, and if A1 is greater than B1, it multiplies the value in cell C3 by 10, by 5 otherwise. The formula compares the values in cells A1 and B1, and if A1 is not equal to B1, the formula returns the sum of values in cells A1:D1, an empty string otherwise. 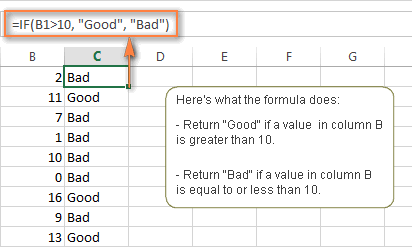 Now that you are familiar with the Excel IF function's syntax, let's look at some formula examples and learn how to use IF as a worksheet function in Excel. The use of the IF function with numeric values is based on using different comparison operators to express your conditions. You will find the full list of logical operators illustrated with formula examples in the table below. Greater than > =IF(A2>5, "OK",) If the number in cell A2 is greater than 5, the formula returns "OK"; otherwise 0 is returned. Less than < =IF(A2<5, "OK", "") If the number in cell A2 is less than 5, the formula returns "OK"; an empty string otherwise. Equal to = =IF(A2=5, "OK", "Wrong number") If the number in cell A2 is equal to 5, the formula returns "OK"; otherwise the function displays "Wrong number". Not equal to <> =IF(A2<>5, "Wrong number", "OK") If the number in cell A2 is not equal to 5, the formula returns "Wrong number "; otherwise - "OK". 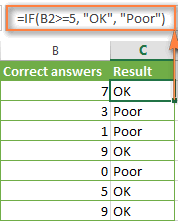 Greater than or equal to >= =IF(A2>=5, "OK", "Poor") If the number in cell A2 is greater than or equal to 5, the formula returns "OK"; otherwise - "Poor". Less than or equal to <= =IF(A2<=5, "OK", "") If the number in cell A2 is less than or equal to 5, the formula returns "OK"; an empty string otherwise. Generally, you write an Excel if statement with text using either "equal to" or "not equal to" operator, as demonstrated in a couple of IF examples that follow. Like the overwhelming majority of Excel functions, IF is case-insensitive by default. What it means for you is that logical tests for text values do not recognize case in usual IF formulas. 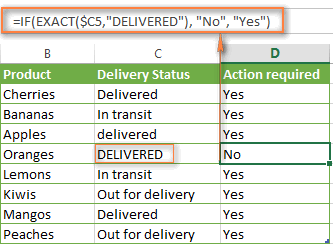 Translated into the plain English, the formula tells Excel to return "No" if a cell in column C contains the word "Delivered", otherwise return "Yes". At that, it does not really matter how you type the word "Delivered" in the logical_test argument - "delivered", "Delivered", or "DELIVERED". Nor does it matter whether the word "Delivered" is in lowercase or uppercase in the source table, as illustrated in the screenshot below. If you want a case-sensitive logical test, use the IF function in combination with EXACT that compares two text strings and returns TRUE if the strings are exactly the same, otherwise it returns FALSE. The EXACT functions is case-sensitive, though it ignores formatting differences. Where C is the column to which your logical test applies and "DELIVERED" is the case-sensitive text value that needs to be matched exactly. Naturally, you can also use a cell reference rather than a text value in the 2nd argument of the EXACT function, if you want to. Note. When using text values as parameters for your IF formulas, remember to always enclose them in "double quotes". If you want to base your condition on a partial match rather than exact match, an immediate solution that comes to mind is using wildcard characters (* or ?) in the logical_test argument. However, this simple and obvious approach won't work. Many Excel functions accept wildcards, but regrettably IF is not one of them. A solution is to use IF in combination with ISNUMBER and SEARCH (case-insensitive) or FIND (case-sensitive) functions. At first sight, it may seem that IF formulas for dates are identical to IF statements for numeric and text values that we've just discussed. Regrettably, it is not so. Unlike many other Excel functions, IF cannot recognize dates and interprets them as mere text strings, which is why you cannot express your logical test simply as >"11/19/2014" or >11/19/2014. Neither of the above arguments is correct, alas. 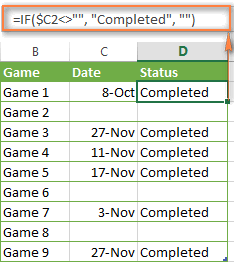 As illustrated in the screenshot below, this IF formula evaluates the dates in column C and returns "Completed" if a game was played before Nov-11. Otherwise, the formula returns "Coming soon". Naturally, the Excel IF function can understand more complex logical tests, as demonstrated in the next example. Use the logical expressions ="" (equal to blank) or <>"" (not equal to blank). The table below explains the difference between these two approaches and provides formula example. Blank cells ="" Evaluates to TRUE if a specified cell is visually empty, including cells with zero length strings. Returns 0 if A1 is visually blank. Otherwise returns 1. If A1 contains an empty string, the formula returns 0. ISBLANK() Evaluates to TRUE is a specified cell contains absolutely nothing - no formula, no empty string returned by some other formula. Returns the results identical to the above formula but treats cells with zero length strings as non-blank cells. That is, if A1 contains an empty string, the formula returns 1. Non-blank cells <>"" Evaluates to TRUE if a specified cell contains some data. Otherwise, evaluates to FALSE. Returns 1 if A1 is non-blank; otherwise returns 0. ISBLANK()=FALSE Evaluates to TRUE if a specified cell is not empty. Otherwise, evaluates to FALSE. Works the same as the above formula, but returns 1 if A1 contains an empty string. The following example demonstrates blank / non-blank logical test in action. Hopefully, the above examples have helped you understand the general logic of the IF function. In practice, however, you would often want a single IF formula to check multiple conditions, and our next article will show you how to tackle this task. In addition, we will also explore nested IF functions, array IF formulas, IFEFFOR and IFNA functions and more. Please stay tuned and thank you for reading! 3,218 Responses to "Using IF function in Excel: formulas for numbers, text, dates, blank cells"
How would I write the formula for if a range contains a value greater than 2, then true? Hi.. i like share my view..
Hi... i like share my view .. I have two worksheet. i.e,Worksheet A and worksheet B. A11 of Worksheet A contains FR189X and B6 of Worksheet B is FR189. Likewise I have multiple rows in Worksheet B. I want to compare A11 of Worksheet A with column B of Worksheet B, if its equal then copy the value present on column F of Worksheet B into Worksheet A.
I am using below codes and its working when A11 is same with B6. But its not working when I want to replace A11 of Worksheet A with B7 of Worksheet B. Can you please help? Is there a way to automatically move a row to sheet 2 if a specific cell contained text? Cell that would contain a date or be blank is G2. If it contained text I'd want to move a2:h2 to sheet2. On sheet2 it would not need to be in any specific place. I have a table with 5 columns, which each column has there own percentage of evaluation for example 25%-25%-25%-10%-15%. I want to create a formula that to look on each cell for each column the number and if it does't find number to take the percentage of that column and spread it to the other columns. In this case it has to take the 25% and the 10% and spread it to the other columns and do the calculations again from the start so I will get the correct number. Who can give a help with this? 2. From my "Stock Quantity" let say i have 1000 stocks, the "REORDER LEVEL is 2,500. i want the row highlighted into color red if the 'REORDER LEVEL IS GREATER THAN THE STOCK QUANTITY'. what formula should i use? ...if the 'REORDER LEVEL IS GREATER THAN THE STOCK QUANTITY'. what formula should i use? I am stumped, I am trying to tie 3 columns together with column 1 having a drop down menu. I need to be able to use the first column to select a city and the following 2 columns auto-populate with amounts. (IF D4=Norfolk, then E4=94 and F4=55) is what I am trying to get to work. Is this even possible? No Anthony that is not even a correct formula. What is the formula to allow an Yes/No response to the induction expiry. Trying to figure out how to show the value from a cell when doing IF.OR function. The function should show empty if empty, but show the value of cell "H14" if P14=Pallet, while if different, show the value of cell "L14". KINDLY HELP IF THIS FORMULA IS POSSIBLE THEN MAKE FORMULA PLEASE AND SHARE..
Is there a way to move value B2 to C1, if so can someone please help with the formula. I am creating a time sheet. For each day I have three columns, Time (15 min breakdown of the day), Activity, and Time worked. I each created an IF function to fill the third column with a value 0.25 if the Activity cell has content. (ie; no content = I have not done any work. 0.25 represents the quarter of an hour i have worked). I had hoped to use a Sum function at the bottom of the third row to add up all the 0.25s to total my hours worked that day. However, the SUM function does not recognize the 0.25, generated by the IF function, as a number (cells are in number format but the 0.25 aligns to the left like text). What's the IF formula you're using? Hello all, I hope someone can shed some light on my issue. I am trying to calculate fuel consumption based on different MOVEMENTS of the ship from cell A1. Cell A1 will either be, LOAD, SEA, MANEUVER, DISCH. Each Movement will correspond to a different CELL with its corresponding fuel consumption rate. SEA corresponds to cell A20 (or 1.02). I tried the IF function, but could only manage to get one IF. ex A1 (SEA), B1=30 hours. FORMULA in C1, =IF(A1="SEA",(B1*A20)). This one works, but I cant seem to add multiple IF functions for LOAD, MANEUVER, DISCH, withouth it saying #value. If you still encounter any difficulties with the formula, please let us know. We'll do our best to help. Thank you so much! That was it! Merry Christmas! Thank you very much for your reply. I'm so glad to hear you found the solution in this article! Unfortunately, there is no way to solve your task using standard Excel functions. Most likely you need a special macro. I am really sorry we can’t help you with this. plzz can you help me???? which formula i use and how???? mail me as soon as possible. i need the solution for the above work. This is the purchasing process. For one material, there are three offers available in quotation. I need the name of the supplier in a column who bidding the price in less. hi , how can i write the fact that if two countries use the same Currency 'euro' for exemple , 1 otherwise 0 ? Where A1 and B1 are the cells that contain currencies. 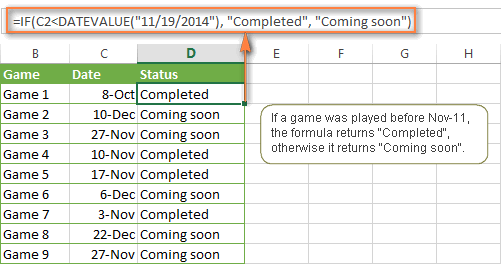 You can learn more about nested IF function in Excel in this article on our blog. Hope you’ll find this information helpful. Hii, am having a challenge with using an IF function to filter data of the type: 12/4/2018 5:53:40 PM. I have got a date captured just like above together with the time and i would like to filter by the date. I'm having all sorts of problems with this. Please help! 2nd tab: Narrowed list of 50 of those businesses for a targeted mailer. I'd like to add a column to the main tab that indicates which businesses on the 2nd Tab were sent the mailer, with an X or something, perhaps. To do this, I have to somehow match the two columns on the different tabs and then if there's a match, an X will appear. I've tried =IF, =MATCH, VLOOKUP with a hundred different options and I can't figure this out. There are several ways to identify duplicates in Excel. One way is to use Excel's built-in duplicate identification tool. Check out this article in AbleBits for several methods to accomplish your task. Where this is in the Sheet1 conditional formula rule. Be sure C2 and the target cell are formatted as dates. I am facing a problem in excel sheet I need your help. I'm really sorry, your task is not entirely clear. If you're getting difficulties building your own IF formula, please look through these IF basics. I have a block of text, i.e. A2:F100, (the amount of rows changes every week) in which column A holds the different "Tape Numbers" (AA0053) that I'm verifying. I copy in a column of current available scratch tape numbers in the H column. What I want is for my formula to look at H2 (AA0008) and search column A. If it finds AA0008 then color fill H2 Green, IF NOT then color fill H2 Red. Then I'll copy that formula down to H3 and so on... I know the =IF statement will do the True/False check, but I'm not sure how to tell it to change the background color. Conditional Formatting only find the "True" statement then formats the cell. I also need the false, so I want an "old school" formula. I'm not well versed with VBA, so I'm hoping to stay away from Macros. From your post it's not clear what type of text should be in the first column, so I just used ISBLANK. Here's what I came up with for you. The cell where this formula is entered displays today's date when A2 is not blank otherwise the cell displays nothing. regarding the =IF(ISBLANK(A2),"",TODAY()) , Will the date automatically update each day or will the date be set to whatever day you saved the file? I am trying to use the same idea. I want the date to post when anything is typed in cell A2, but I dont want the date to automatically update each day. I have to create a single file for each day of the month and am hoping to not have to go into each file and type the date each time. Looking to create a template. I need help with a task. I have three columns, One has a list of vendors and if that vendor was on our job that month I put a Y in the 2nd column next to his name. The 3rd column then will have another Y if that vendor has turned in his paperwork for the month. What I want is if the 3rd column is blank i want to highlight it. But if there is No Y in the 2nd column then I want nothing done for those cells. So in other words, if the vendor wasn't onsite then I don't care if his paperwork is in. But if he was and he hasn't turned it in I want his cells highlighted. How do you write an IF formula for a question and answer sheet?. Example of sheet would be Line 1 the Question and line 2, 3,4 & 5 would be the answer following a check box next to each answer. When checking the box it would show True or False at line 6. Would someone help me with this assignment, it is urgent! We want to find the average grade but if i have all A and only a F in the average grade the argument should be "fail" (maybe this is with "IF" function) and i don't know how to do this. But now I'd like to pull the data from those 3 columns (each pulling from a different tab) and do if statements to pull my answer into one column. So, for example, State = AL, B1 = yes, c2 = blank, c3 = yes. How do I write a formula to look at all 3 and pull which column isn't blank? I'm trying to set up a sheet to keep track of cleared checks. I have a column that has the check amount (Col B). I have a check box to indicate it if was cleared (Col J). I want to have a column for the calculation (Col I). So if the check is Cleared (True) then this Column shows 0. If it is not cleared (False) then it shows the same amount as Col B.
I'm only trying it on a specific cell to make sure it works first. The one I have will not return a dollar value. What am I doing wrong? Ihave 3 column "Amount" "Norm" "stab"
Hi, I am trying to write an if statement to return the value of 0 if the number in column c = 38 and if the number in column c is not 38 return the value in column O in the same row. WHEN I TYPE ANY OF CAR NO IT SHAW OWNER NAME BY FORMULA. I'm trying to write a formula for the cell to display "x" if the date is greater than TODAY and if the cell does not contain any text. & If A1 is greater then 350 A2 should be "OVER DUE"
How to I call to both numbers and have text in my if statement. I want to say something along the lines of "You are " + x + " dollars over budget". With the X being a called variable able to be changed. I want answer as "Sensitive" or "Insensitive" as per the texts in the reffered cell. exp: =if(A2= 376/377/376A/376B/376C, "Sensitive", "insensitive") .. hope you get my Idea what I am want in separate cell ? I am trying to write an IF statement for a gym membership. Column C5 is the cost of the membership and Column D5 is the extra cost for a locker. If there is a YES in D5, add $75. If NO, no extra cost. i need some help in replacing the column text. Scenario: A3 needs to be replaced in new column J3. If it matches with the values in (B3 = H3 AND J3 = C3) when the data between these column matches i need to replace the text value from A3 to J3 else "NA". Can someone please share the logic that would be much appreciated!! How can I sum this column automatically? I am trying to setup a formula that looks at the contents of a particular cell (either Global Brokerage or USA Brokerage) and then, depending on Global vs. USA, I want to point to a 1 of 2 cells that contains a percentage. The percentages can change and I do not want to type the actual percent into the formula. I want to point to the % in 1 of 2 cells. Hi , may I seek some helps on excel function... is there a way for the excel function to do an automatic recalculation if a defined criteria is not met..like IF B2=5 or less than 5 then goto do recalculation.. I have an simple If function in B1 for example =IF(A1>=1,"1","0"). The entry number works if I use it in a =SUM formula horizontally in D1 =SUM(C1-B1). Example: A1 entry is 2, B1 becomes 1. C1 entry is 4, D1 becomes 3. Works great. Here is where I run into trouble. I copy formulas vertical example: B2, B3, B4... then attempt a simple SUM formula =SUM(B1:B4) the result is always 0 even if B1 thru B4 all have 1 as a result. I have tried several ways to do this,please help. Please assist me as I am trying to create if then function in excel but I don't know how to include if the cell is blank =IF(K2335="eamc","YES","NO") but this statement also put "no" if the cell is blank. how can I make it like if there is no data then it has to be blank as well. that looks at the contents of a particular cell (either Global Brokerage or USA Brokerage) and then, depending on Global vs. USA, I want to point to a 1 of 2 cells that contains a percentage. The percentages can change and I do not want to type the actual percent into the formula. I want to point to the % in 1 of 2 cells. I'm trying to use this formula for these three qualifiers. Can't get it to work. Any suggestions? What my goal is to have a set of cell content only (B4:K6)to empty at 6am daily. Is it possible and if so how do I accomplish this task? Problem getting IFS formula to work. Problem I want the formula to read the cell and if it contains a certain text,then it is to input certain text, and if it is another text,then input another text,if the cell contains a certain text,then input a certain text. Formula only regonizes CAR and inputs A.V.,but will not work for other two conditions. I want to write a function that will find alternate minimum value for a range where logical value TRUE equal 1 and the logical value FALSE equals 0, and the text and blanks equals 0. I am in desperate help of trying to figure out an if statement that can help me calculate # of days past due. I have a column for start date, end date and actual date of completion. I have a column with a formula for today’s. Originally, I used the networkdays formula to calculate the days from due date to today’s date, but when I put in the actual completion date, the past due days keeps updating and I don’t want that. Have no idea if that made any sense. But hopefully someone can help me out !! I have two columns. Column G is my due date and column J says whether I have approved or denied the application. If the due date is in the next 7 days, from today, and the corresponding cell in column J is blank (meaning I have not approved or denied the application) I want the cell in column G to highlight, or the row, to let me know the due date is coming up and I have not taken action on the application yet. I am pulling my hair out on a formula. I have a workbook with 5 tabs ( Gen212, Poe,360 BWS, sample, Production). What would the formula be to have a flow number from tab 5 (production) in column H row 7 automatically populate into tab 3 (360 BWS) in column C row 18? trying to write a formula that will look at 3 inputs and assign a point value. i need a formula that will assign 3 points to the highest score, 2 points to the second highest and 1 point for the lowest. I hope everyone is well ! I am looking to have this cell note that if a time is not put into the cells ( h21/g21 ) this information is current data validation from another sheet - and instead the word "holiday" is added the cell will generate an automatic number ? is this possible ? any help would be great ! Out normal working hours for a "holiday is 8 hours" so if the cell says holiday i would like it to default this to "8"
I have few different numbers (example 35413565 , 14451844) nd I need if first number is 3 then text in other column is (ex.YES) or if is 2 then text NO. I want a function in excel where when I enter "A" as absent in respective Cells for a month then other cells are marked as "P". I have a summary column that I just want a numerical value to appear in. So if someone chooses goodbye my summary column would show 2. If someone chose hello is would show 1 etc. What is the formula I should have in the summary column for it to determine this? Lets say the drop down values are in column B2. is there any formula to find out the total figer of a person whose name in a sheet 3 to 4 time. Hi, I'm trying to create a formula that will provide a "True" statement if the cell is blank between 1/1/19 and 5/30/19. Then a formula to identify blank cells after 6/30/19. I'm using these formulas for conditional formatting. if i want to input a value in cell A1, then each time the output value in cell B1 must be added to that value. in this scenario which formula i should use ? Hi, im looking for the right formula to identify the value statement. I have the formula which i stated below, doesn't work. Could you help me on this matter. The idea is: i will insert the data in C30 and if it's blank it will show "Please insert rank in cell C30" but if it's not blank it will show the value that searched through the table which is between "b33 and b41". So far it worked (without using AND formula). Lastly i want the insert values to be between 0 and 10. So i put the and formula but it doesnt work.